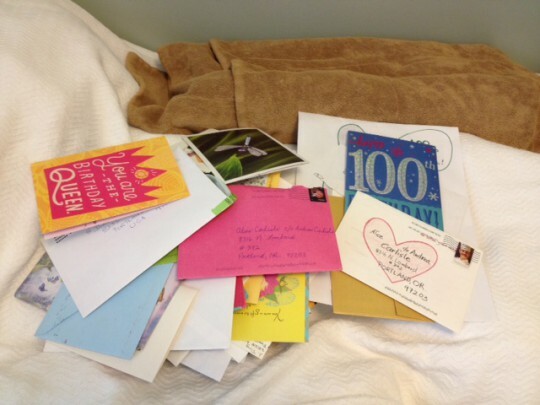 She understood through the cards and my reassurance that she had reached her goal of 100. By the time she was ready for the reading to end, there were so many cards on the bed she surely must have felt through the bedclothes the comfort of all that love, kindness, wit, originality and beauty resting against her. After she died, I lay on the bed beside her and held her for a while and cried my heart out, but for myself and not for her time coming at last to leave this life behind. She wanted to reach her goal of 100. She did it. I’ve never met a more determined woman. She wanted and deserved a peaceful death. I believe she welcomed it. We made sure we were clear that we had forgiven each other for everything that needed forgiving back when she was staying at Hopewell House. We made sure we thanked each other for everything, too, and we acknowledged how important these past years together have been, the time necessary to heal old wounds between us and get to know one another as two women who made their way in the world along very different paths but came to respect and admire each other anyway. “I never knew I loved you so much,” Alice said to me one night as we pressed our foreheads together, she in her hospice bed and me perched alongside. I felt the same, because it seemed to both of us that the love had been there all along, underlying everything, waiting to be recognized and completely known. When I lay next to her and held her after she’d died, there was a moment of pure ecstasy that seemed to fill the whole room, as if we both were rising up and touching an awareness that the two of us had accomplished something wonderful together. If you want to take something from this story of Alice and me, take this: Whatever healing you’re waiting for to happen out there in your world, just know it’s possible. It is. More to come, but for now I’m going to attend to the things that need attending to after a death. Meg is with me. My friends have gathered around. I feel a little unanchored, but I’m okay, and I hope you are, too. Love to all of you. 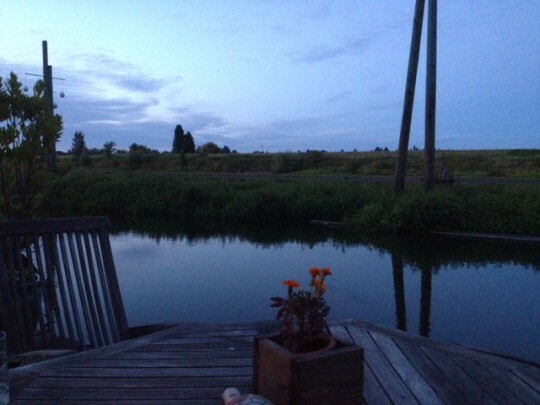 The river from my houseboat deck on the evening of August 26th. Oh Andrea, I wish you nothing but peace and healing as you go through the next days, weeks and months. I did not know you or Alice directly, but truly feel as if I did, because of this blog. I will give one piece of advice: grief is not linear. It does not go in a straight line, it zigs and it zags. You will feel better, feel worse, feel better, and may go back and forth multiple times in a day. There is no “right” or “wrong” way to grieve. There is no timetable for how long you “should” grieve. Having worked with many hospice patients and families, the saying I like best is that Alice has had her “celestial homecoming.” Be well, my blogging friend! Thanks for all that you have shared……I am so sorry for your loss. Dear Andrea, I am so, so sad for your tremendous loss, but grateful that you were with her, that Meg was there, and that you are held up by the love and support of your friends. Be well. I love you my friend. What an amazing journey. Thank you for sharing it with us. Thank you dear Andrea for all you have done for Alice. Now is your time to let us do for you(at least for awhile ) ❤️🙏🏽. May the memories of Alice always be a blessing. Andrea, my heartfelt sympathy to you in the loss of your dear sweet mother. Thank you for sharing and taking us along on your journey together. My thoughts and prayers go with you now as you begin your grief journey. Your mother was so blessed to have such a caring attentive daughter! You will, no doubt, have a big hole in your heart in the days, weeks, and months ahead. Fair winds and following seas, dear Alice. What a wonder you are. Thank you for, well, everything. And Andrea, may the love of all of us (crying in solidarity) envelope you and comfort you. Glad Alice had a peaceful end. We should all be so lucky. Oh Andrea, no matter how much you’ve anticipated this moment, it still may feel as if you’ve been slugged in the gut. It hurts!! Cry whenever you need to. You’ll hear Alice’s voice and remember her sweet gestures forever. Thank you for all the stories about your wonderful relationship with your dear mother. I’ll be thinking of you a lot these next few weeks and months. Life will forever be different for you. And like Sheri said, there is no timetable and it will not be orderly and linear. Yet, would any of us who have travelled this road done any differently? Oh Andrea. Tears. And yet I imagine dear Alice sailing, laughing, free. Sending love to you and comfort for the days ahead. Thank you Andrea for your loving tributes to Alice. I am so happy that in the end, you both discovered or rediscovered, the deep love you have for each other. Please now spend some time focusing on yourself and making sure you get what you need. I know there is much to do, but also take time to pamper yourself, to grieve and to celebrate Alice’s 100 years. How can I express sympathy when it feels more like jubilation! Alice accomplished her goal of living past 100; both of you appreciated, nurtured and loved each other; and you, Andrea, shared it with the world, attracting supporters and making friends along the way. This is truly a story of life and of love. Oh, Andrea, May her spirit Fly… May you know the peace that comes with all the healing you both did. Alice and You are in my heart. You have had an exceptional experience that many people only dream of. You “Knew” your Mother well. to know ones Mothers love and to give it in return is a gift in life that not all have been given. What a blessing that you and your Mom found those gifts, one for the other. Peace be with you Andrea and thank you for sharing your gift of story telling with all of us. Andrea, your chronicles and love over the past 6 years have been so touching. Embracing death ultimately makes it peaceful. Thank you for all that you gave to your Alice and to all us by sharing your poignant mother and daughter journey. Sending compassion and gratitude during this time of transition and loss. Dear Andrea, I feel grief, relief, and joy at Alice’s passing peacefully and surrounded by your caring love. Extraordinary that I will miss this woman I have never met but have come to know through your chronicle. Holly tells me there may be a book. Meanwhile, expect to be surprised from time to time by Alice’s appearance — there really are ghosts, not scary but comforting, and they live on in you. The hardest death there ever is is when your mother dies. There is always that special bond between mother and daughter. You took such good loving care of Alice for a long time and I know she loved you just like you loved her. Having been there myself, I would recommend that you go easy on yourself for the next year till the sharpest pain subsides, and it will. I’ve been through enough deaths to know that time really does help. Darling Andrea. Wow. Your Alice, and because of your generous sharing, our Alice, has shed her one hundred year old body, to soar towards what’s next. Magnificent. May we all celebrate her. May you experience again and again deep ecstasy and peace. Alice was a treasure. Thank you for sharing her with us. May your many wonderful memories of her bring you comfort and peace. Take care, dear Andrea. Andrea, thank you for sharing dear Alice’s life and passing with us. Take good care of yourself now and know that our arms are around you. Much love. “I never knew I loved you so much” – oh my goodness!! Such a journey!!! And Alice went out on her own terms – so great. You gave her that. You are a wonderful daughter. I know the profundity witnessing life leave a body. I’m so glad you’ve been there for Alice and I’m so glad Meg and others are there with you for this next bit. Sending love and peaceful rest. What a beautiful love story you two have weaved together. My thoughts and prayers are with you Andrea. Your Mom was a very special lady and she has a wonderful daughter. Hugs and love to you from someone who you don’t know, but has shared your journey. I will never forget how kind Alice was to my Mom Rachel at Hopewell House. They enjoyed each other’s company for a couple of days before they each went back to their previous care homes. Mom is still with us although she is sleeping most of the time. I enjoyed meeting Alice and knowing her through your blog. Oh, dear, dear Alice. How we all will miss you. You were such a force of nature, it seems unreal that you could be gone from this earth. My heart feels like it is breaking. Goodbye, beautiful Alice. I hope your adventures are just beginning. Andrea, my gratitude cannot adequately expressed. Thank you so much for sharing the stories of you and Alice. They have touched me and inspired me so much over the years in my own relationships with my mother and my daughter. Please let this community help in your grief and your healing. Perhaps writing to all of us who love you and Alice so much will be of comfort. It is an amazing thing to care for the one who gave birth to us, whose body we shared and emerged from, who cared for us. And it is profound to be with her when she leaves that body. I’m happy the two of you had so much healing, I’m grateful you have shared this journey with all of us. I cannot imagine any way the last years could have been deeper, richer, or more full of life and love for her–or a more beautiful passing when she was ready. May her memory be a blessing, as her life was. And may all the time and space you need for grieving open up for you. Sending love and light. Andrea, I wish you peace, strength, love, and the joy over knowing that you tended Alice’s needs so well. Thank you for your writing about your journey. It’s one of the things that has sustained me. Dear Andrea, my mother died suddenly when she was just shy of 56 years old. I didn’t get to know her as an old woman, or have her know me as an older woman. Sharing your special years with Alice has meant a great deal to me. I learned a lot from both of you and think you are both extraordinary. Thank you. With deepest sympathy to you and Meg and everyone who loves Alice. The something to take away, I gratefully take. All really is well. Great love to you, and I offer my hand and heart and time to you as wanted. You will be touched to know that my mom called this morning specifically to ask how Alice was doing. Love and peace to you, dear Andrea. Please keep blogging. What a loving and peaceful death Alice had… We should all be so lucky to go so gently. Take time to care for you. Please know you were the best daughter in the world and we are crying right along with you. Thank you for allowing us to send cards and feel like we had a part in helping Alice glide into the next life feeling so loved. My thoughts are full of you and Alice, and all that you shared with us over these last years. What a great gift, to come to an understanding of love, as you did. What two open and accepting and courageous hearts, to make that happen. Godspeed to Alice. Though I never met her, I felt I knew her a little through what you wrote here, and I will miss her. Much love to you, Andrea. I’m so sorry that Alice has left us, but happy that she achieved her goal. I know my friend, Rhoberta Hirter , enjoyed your stories so much. She used to send me to the blog frequently. Maybe a Rhoberta and Alice are having a grand time. Oh sweet friend. Thank you so much for sharing the many steps of this journey. I hope that the tide of love coming your way helps you to bear your loss. You have been a wonderful daughter and also wonderfully generous in sharing your experiences with your fan club. Thank you for that. Yay, Alice! Made it to 100! Vaya con dios, you brave and determined soul. Big hug to you, Andrea, and all my best to Meg. Oh, Andrea. I’m so saddened to hear that Alice has passed. Thank you so much for your generous gift of sharing Alice, yourself, and Alice’s adventures in aging with us for all these years. I’m going to miss reading those stories. I wish you a smooth path to healing. Lots of love being sent your way. My hope for you is that you grieve fully and are loved well through it. Condolences to your family in their lost. Thank you for letting us in, Andrea. And now rest, dear devoted Andrea. What goodness you and Alice have brought to us all. Your journey with Alice has been a blessing for so many people in addition to the two of you. Thank you. And condolences: wishes for your peace and finding the support you need, along with the understanding of so many of us, having gone through similar losses less well articulated. This is truly a journey of love and hope, and I so appreciate your having shared it so openly and willingly. May the river help to heal your heart. Andrea, I’ve been thinking of you this past week, knowing Alice was about to turn 100 and that she was in hospice, and thinking the end was probably near. I’m so grateful for your blog, partly because it expresses a lot of what I feel about my mother, who’s still alive, almost 90. I’m sure you’ll feel a huge hole in your life and heart, but I’m glad you having loving friends to support you. Let them! I was just checking to see how you are doing…Hugs. Hi Andrea, just stopping by to say you are in my thoughts, and you are loved. Dear Andrea, add my name to the list of readers who appreciate so much the gift that you — and Alice through you– have given to us. My life has been much enriched by your blog. Alice is a part of you. You will never be without her. Love is what it is all about. hang in there Andrea. Alice is in a better place & she went happy to have made it to 100. take care of yourself & remember she loved you. Thank you for sharing so much with all of us. I’m so sorry for your loss. May Alice rest in peace and happiness knowing that she made it to 100. Andrea Carlisle. I am happy to find out that you have continued writing. The Riverhouse Stories is lovely, beautiful. A real treasure. Thank you, Kathleen. I’m sorry to be late in responding. Because I no longer write the blog, I rarely see the comments. Much appreciated.